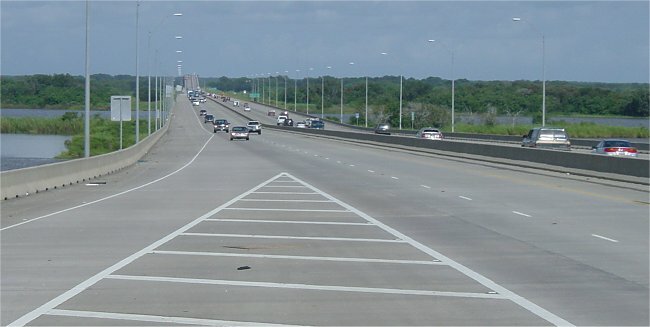 This section of Interstate 10 traverses the coastal plain east of Houston. It was originally state highway 73, and was one of Texas' first rural highways built to interstate standards in the 1950's. Most of this section has been reconstructed to a modern six-lane facility in the last 10-15 years. 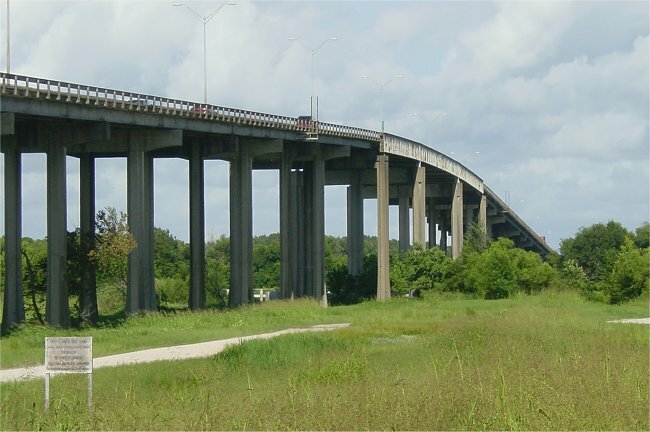 However, the Trinity River Bridge is still the original, substandard bridge dating from the 1950's. 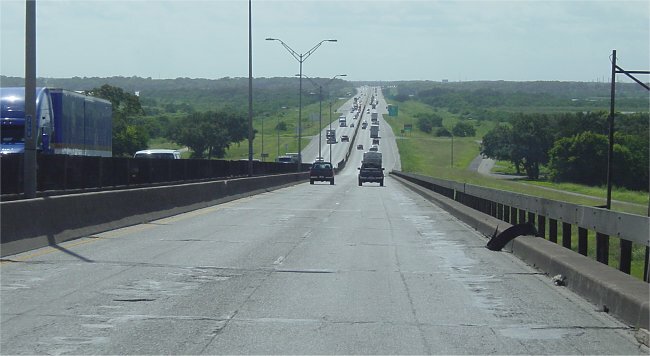 The TxDOT unified transportation plan (UTP) shows a $40 million bridge replacement project, as well as several other projects to upgrade adjacent 4-lane sections to 6 lanes. However, the bridge and most of the expansion projects are unfunded, so they will not start construction within 5 years. The surrounding landscape of this section of Interstate 10 is mostly pasture, but there are some patches of forest. This region receives 50-55 inches of rain per year, one of the wettest regions of Texas. (click for high resolution) Looking east at the bridge across the Lost and Old Rivers. In the background, the Trinity River Bridge can be seen. 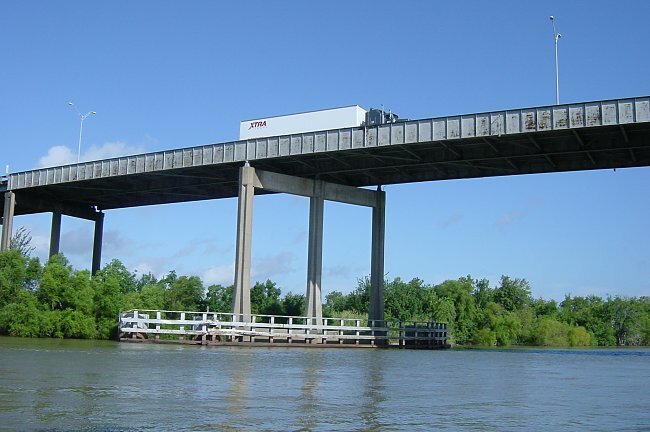 This bridge is a modern structure (not the original structure), and is wide enough for six lanes. However, part of the bridge deck is striped of and only four lanes are used. The Trinity River bridge. This is the original narrow bridge, dating from the 1950's. Another view of the bridge. This area was mosquito infested. Looking eastbound at the start of the bridge. Very narrow. Driver's view going westbound on the bridge. (click for high resolution) Looking west from the FM 1410 overpass. (click for high resolution) Looking west from the FM 1724 overpass. This is not a view from Interstate 10, but it is near Interstate 10 so I included it. 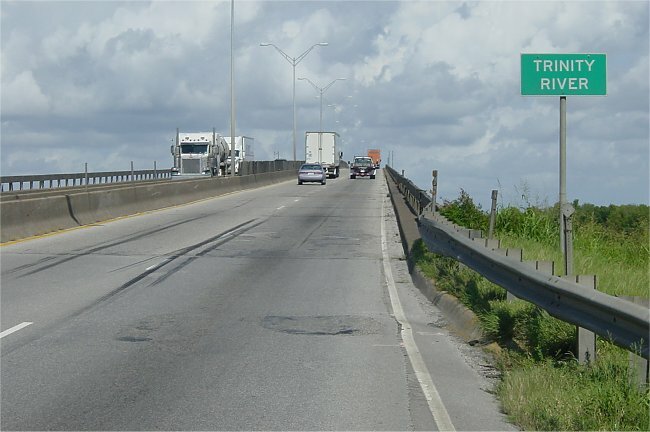 This is the Texas 124 crossing of the Intracoastal Waterway about 15 miles south of Interstate 10. Just in case you're wondering, this is what the Intracoastal Waterway looks like. This view looks west along the intracoastal waterway from the 124 bridge.